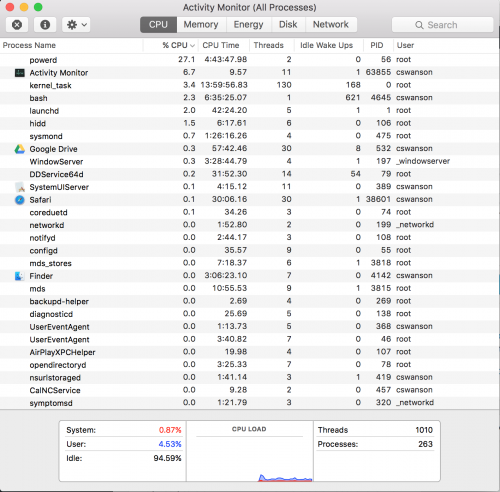 I was recently in Activity Monitor checking network info when I noticed that powerd was using an inordinate amount of CPU time on my macbook. It’s a little odd for the power management daemon to be the source of a power problem! After poking around a little more I noticed that the activity monitor stores power consumption infomation and the light switched on in my head. A quick look at top confirmed my suspicions. The reason powerd appears to be using a lot of CPU time is because when you have activity monitor open it’s querying it for power information. 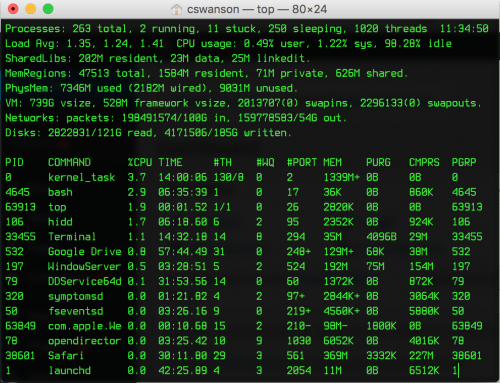 So if you suspect powerd is using a lot of CPU time I suggest closing Activity Monitor and using “top -o cpu” instead. I notice that in the last months (2017-18), Activity Monitor is also very slow to respond–basically I must wait several seconds between each click or scroll attempt. Any relation/fix?